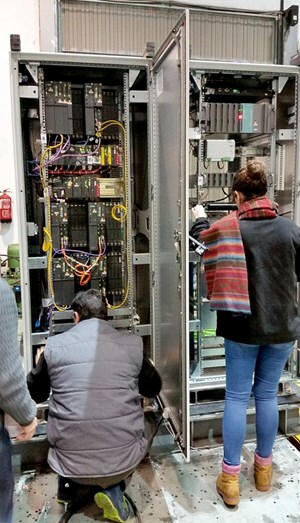 ITER's nuclear safety control electronics have undergone a series of tests in order to demonstrate that they can continue to perform their functions flawlessly even in the case of a seismic event. The three test specimens on the shaking table that reproduces the movement and acceleration expected during the postulated earthquake. The specimens are connected to a test tool that executes the tests and records all data. The mission of the nuclear safety control system (SCS-N) at ITER is to protect people and the environment against nuclear hazards through instrumentation and control (I&C). SCS-N is charged with detecting incidents or accidents and controlling all the active actions needed to prevent or mitigate those situations. It is composed of the nuclear central safety system, provided by the ITER Organization, and several nuclear plant safety systems supplied by both ITER and the Domestic Agencies. The contract for the design, qualification and supply of the nuclear central safety system was awarded to a Spanish consortium formed by the companies Empresarios Agrupados and Inabensa. 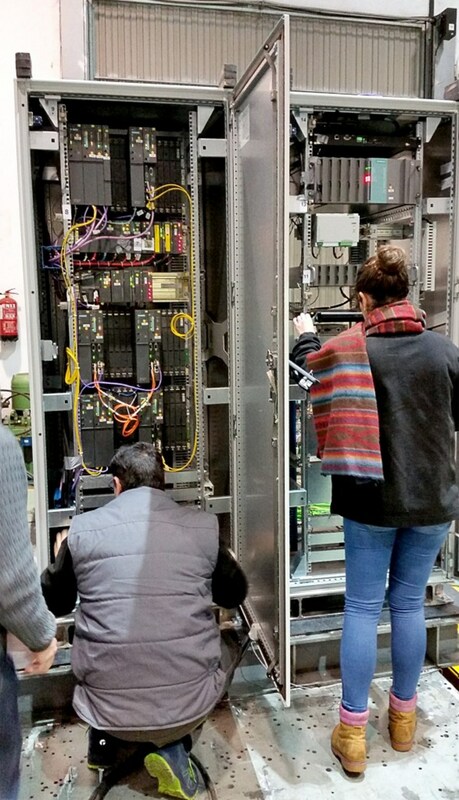 From 6 to 9 February, seismic tests were carried out on the nuclear safety control system at VIRLAB, a laboratory located in Basque Country, Spain. 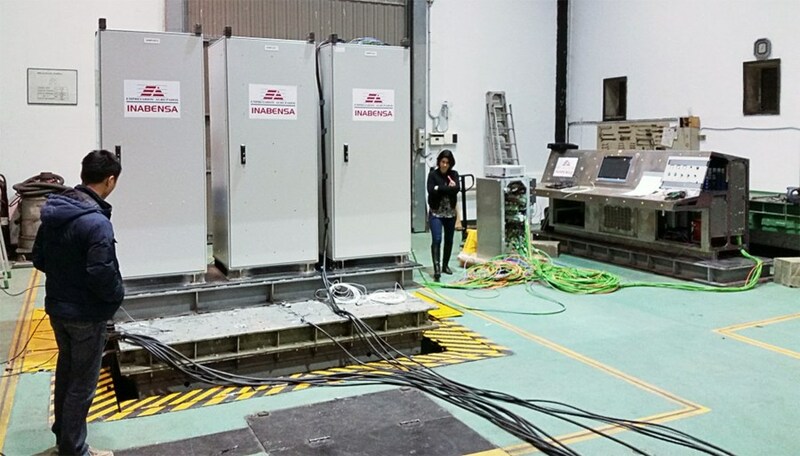 The objective of the tests was to demonstrate that the nuclear safety I&C systems will execute their functions properly during and after an SL-2 earthquake, which corresponds to the reference seismic level on Cadarache site. The electronic components had been aged in previous tests to simulate a situation in which the seismic event occurs near or at the end of ITER's lifetime. In this photo, experts carry out visual inspections. The tests were performed on a set of three test specimens that covered all expected configurations in ITER nuclear safety control cubicles. Moreover, the Required Response Spectra (RRS) used for the test is an envelope of the seismic spectra of the different locations in ITER that will house protection-important or safety-important (PIC or SIC) control cubicles. As a result, no additional tests should be necessary to seismically qualify any ITER nuclear safety control cubicle, a standardization that yields both cost efficiency as well as a reduction in technical risk for the project. An operational mockup of the operator desk was also tested at VIRLAB. In order to cover the situation in which an earthquake occurs at the end of ITER's lifetime, after decades of operation, the components that were subjected to the tests had been previously aged by a series of tests whose aim was to speed up the normal ageing processes. During those tests, the electronic components were exposed to aggravated environmental and operation conditions. The tests were executed on a biaxial shaking table able to produce the movement and acceleration expected at the postulated earthquake. Once the test set-up was ready and all preliminary checks were performed, the test sequence began with an exploration of the critical frequencies of the specimens along each axis. Then the specimens went through five lower level earthquakes both at XZ and YZ directions in order to induce any mechanical ageing in the structures and equipment. Finally, the tests at SL-2 level were executed also along XZ and YZ axes. The attached videos correspond to SL-2 level tests, which lasted about 20 seconds each. During the tests the control equipment was running a battery of tests that recreate the normal operation of the system, allowing technicians to verify that it was not affected by the "earthquake." These tests were executed before, during, and after subjecting the equipment to the seismic conditions and were complemented by additional diagnostics, including the scan of hard drives, the activation of the protection systems of the cubicle (such as fire extinction), and verification of the redundancy mechanisms of logic solvers. The results of these seismic tests will be incorporated into the qualification files of the nuclear safety control system, together with the outcome of other tests and different analyses and justifications. All of these important steps will demonstrate the ability of the system to meet requirements within any of the postulated operating conditions. Click here to view a video of the test.